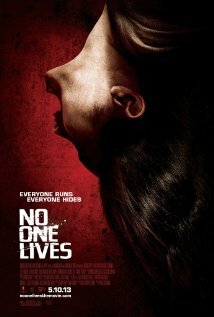 Anchor Bay Entertainment releases No One Lives on May 10th, 2013 at the AMC Empire 25 and AMC Loews Village 7. NYC MOVIE GURU: What appeals to you about wrestling? About dark themes? Brodus Clay: As a lifetime wrestling fan growing up, I think it's like living in a comic book. You have the heroes, villains, a live audience and those sitting in front of their TV. You're either a cowboy or a bad guy. And it's quick. You don't have to wait for stuff--it's every week. That's the appeal to me for wrestling. As for dark themes, it's the same kind of thing. It always brings people together. Scary stuff brings out your imagination. It's fun. NYC MOVIE GURU: What are the important qualities that make a truly good wrestler? BC: Physical strength isn't as important as you would think. Mental toughness, yes, but probably the biggest quality is education---knowing your craft and your history. Also, putting your time into training---focusing on your weaknesses and always trying to improve. Wrestling is no different than boxing, football and baseball. We're different in terms of how some of our stuff is simulated combat, but you gotta be able to go and be able to stay at the level. Every guy wants to be the best. You always have to improve yourself. I think I've a good job of that throughout my career. I've gotten bit leaner and added stuff. I've had to pull back a bit sometimes in terms of telling the story, but when the time comes they're going to be like, "Ok. Here you go" and you got to be ready to go and be prepared. It's an involving game. I try to stay astute in the game as much as possible. I'll recite quotes old movies with my buddies, like "This is Sparta!" from 300. I do a lot of different things to get fired-up and excited. NYC MOVIE GURU: What aspects of wrestling do you think are often underappreciated or misunderstood? BC: The amount of work that the guys do. Somewhere it's lost in translation how much work goes into being part of the WWE in terms of media responsibilities. It's not just about going out and wrestling anymore. You need to entertain, have different levels and to be approachable. Nowadays, I have 1 1/2 or 2 1/2 days off and the rest of the time, I'm gone. When you're home those two days, you pay bills, you gotta train, work out and see your family. There's a lot to get done in those two days, but it's a non-stop thing. I don't get home on Wednesday and get an email about what I'm doing on Monday. I'll do a week of live events, drive 200 miles or so to wherever I have to be on Monday. There'll be meetings at 5:00 where you get told what's going on. At 7:45, you gotta produce, so you have two hours to tell a story and make sure that people believe you. The affect of wrestling is tremendous on your body, mind and soul. NYC MOVIE GURU: What were some surprises while being on the set of No One Lives? BC: There were a lot of surprises. Probably the biggest surprise is the amount of synthetic blood involved and the taste and smell of it. You might of heard that it takes like syrup and that it's sweet. No, it's not! It's disgusting! How things get done--the tricks of the trade--also surprised me, like how they rigged stuff so that the blood would explode and how much time it takes to get that right take so that it wouldn't look staged, especially nowadays because we're so desensitized to everything. NYC MOVIE GURU: Where in the spectrum of pessimism and optimism would you consider yourself? BC: I'm very optimistic in terms of where I'm at in my career. Being pessimistic about myself in terms of what I consider a success keeps me working hard. I'm very grateful about where I'm at, but I remind myself of all the failures and mistakes I've made along the way so that I can continue to work to improve myself. I was fired from the WWE before my character came up, so that was definitely a low point. I've had some setbacks in my career in terms of where I wanted to be, so in remembering those when you have success, it sort of balances out. BC: The timing, i.e. with the jump scares, has to get you. Another important element is blood placement. There can't be too much or too little and it can't be ridiculous. Also, the psychology behind the killings. It can't be a ridiculous kill that makes no sense. Those things are important, but to me the biggest thing has to be the music. For a horror movie to work, the music/score has to be on point. It better have that one song that gets you. No One Lives captures a lot of what I like. It's not digital; it's old-school film. The stunts and make-up aren't computer-enhanced. You definitely feel the pain because it looks real, tangible, hits your eyes and makes you react.